We have finally found a way to update the site! Please be patient while we make changes! Elm Street Christian Church is prayerfully determined to be no part of the denominational confusion existing in our world today. The name Christian means Belonging to Christ, a name acceptable to all, not devisive or sectarian. It is used in our name because the congregation has no denominational affliation, and desires to be known as a church belonging to Christ. We seek to follow the Biblical pattern in all things, our conversion and practices as a church. In keeping with the practice of the early church, we have communion (the Lord's Supper) every first day of the week. Acts 20:7 We select Elders Acts 14:23 and Deacons I Timothy 3:8-12 from among our eligible membership, who serve our congregation. We acknowledge Jesus Christ as Lord and seek to obey Him in all things. At the close of each service, we give an opportunity for those who desire to accept Christ to do so. If you desire to become a Christian, please come forward as we sing the invitation hymn. You will be asked, "Do you believe that Jesus is the Christ, the Son of the Living God?" Upon confessing your faith in Christ, you will be baptized. 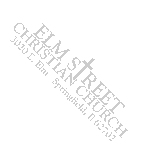 Those who are immersed believers in Christ and desire to become members of Elm Street Christian Church should come forward during the singing of the invitation hymn and state their intention.